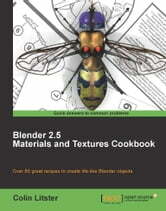 Each chapter in the book follows a themed approach to creating materials using the new Blender 2.5 features. As you read through each chapter you will learn approaches to create materials and textures. These materials and textures will help you to create a flawless simulation of real-world objects. You need not read the chapters in any particular order to learn to use the Blender 3D suite for materials simulation appropriately. Every recipe in this book will enable you to create a usable material or texture effect as well as teaching you techniques that save your time. If you are a Graphics Designer looking to master the features for materials and textures to create realistic looking models in Blender, then this book is for you. It can be read by both beginners and experienced Blender users; however, prior understanding of object creation and manipulation in Blender would be an advantage. This is a must-read for Blender users who want to learn the concepts and at the same time experiment with the different Blender Material and texture functions.